December 23, 2018, marked an important milestone for GPS. The successful launch of satellite USA-289 represented a key success in what has been a monumentally expensive government program, beset by delays and overspends. 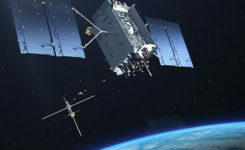 The launch of the first GPS Block III satellite, the first that can provide the full military M-code capability, effectively commenced the physical roll-out of modern M-code hardware. Ground Control. As far as the space segment is concerned, M-code is finally underway. What about the ground segment? The next-generation GPS operational control system, GPS OCX, is essential for use of the full capabilities of the new Block III satellites. It has been under development for some time. OCX has drawn Congressional criticism and correlative media attention, but recent reports have been more positive. Since the Nunn-McCurdy breach of 2016, when the project’s future hung in the balance, accounts have grown gradually optimistic. Budget and schedule were re-baselined, and contractor Raytheon’s corrective actions generated results. In the fall of 2017 the Air Force took delivery of OCX Block 0, marking a significant milestone. Block 0, also known as the Launch and Checkout System (LCS), demonstrated compliance with contractual requirements and was accepted by the Air Force. In spring 2018, Block 0 underwent a series of cybersecurity tests and passed, validating the security architecture of the system. All this puts Raytheon on track to deliver OCX Block 1 in 2021, providing full operational capability. Block 1 and Block 2 are intended to be delivered together, adding operational control of the modernized satellites and signals, including L1C and the modernized M-code. The GPS Control Segment Sustainment II (GCS II) contract was awarded on Dec. 21, 2018, and is worth $462 million. GCS II will support operational capability of M-code in 2020, and continues until 2025, and so there will be a period of overlap between GCS II and OCX, essentially providing two options for controlling the new GPS III constellation. In one view, the Air Force is backing two horses to improve chance of winning: OCX the preferred solution, with GCS II almost like an insurance policy. With the GPS III ground and space segments looking relatively healthy, attention turns again to the user segment. Until now, the military has used the classic P(Y) signal: a binary phase shift keying (BPSK)-modulated encrypted wideband signal. 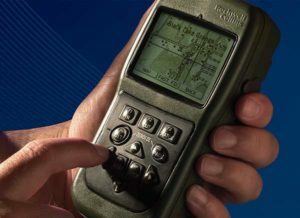 It offers both greater accuracy and increased jamming resistance when compared to the civilian C/A code still employed by the vast majority of GPS receivers. But the P(Y) code has its drawbacks in the modern world: its wide main lobe sits directly over the top of the C/A code signal (see Figure 1), essentially occupying the same spectrum. When the civilian C/A signal is jammed, the military P(Y) signal is at the very least degraded, if not also jammed itself. It also uses a relatively simple encryption scheme that does not meet today’s cyber security requirements. The M-code signal, on the other hand, is the first military GPS signal to use the BOC modulation scheme. BOC modulation gives signals their distinctive two-lobe appearance, spreading the signal’s energy away from the band center. The wide spacing of the two sidebands separates the M-code signal from the civilian signals (the legacy C/A signal or the new L1C signal on the L1 frequency, and the L2C signal on the L2 frequency). Amongst other things, this allows the military to jam the civilian codes without noticeably degrading the M-code signal. Often referred to as blue force electronic attack (BFEA), this is essentially a new facet to navigation warfare (NAVWAR), where enemy use of GPS can be denied whilst allowing friendly forces to continue using it. The wider occupied bandwidth and increased signal power also help to make M-code more resistant to jamming. M-code also makes use of more modern and flexible encryption methods, ensuring it will be secure and safer from threats such as spoofing attacks. Scepticism. Defense programs are known for their long procurement cycles, but even by these standards, M-code has taken an extremely long time to get where it is today. Given the enormous cost of the program, and the fact that there is still, as yet, no operational benefit to show from it, many people have questioned its worth. 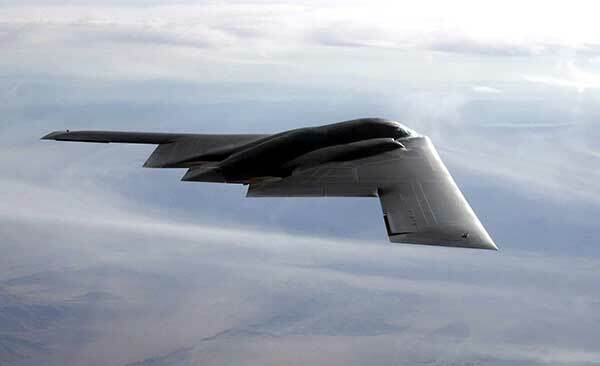 At the time it was conceived it represented a dramatic step forward in military capability but, because it has been so long in development, its operational benefit is becoming diluted. When M-code was conceived, GPS was still the only operational GNSS in town: everybody had to use GPS — or nothing. Today, the picture differs greatly. 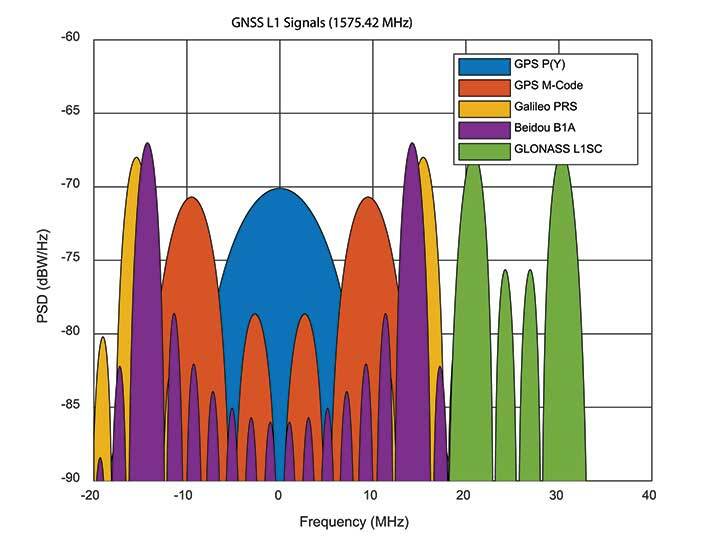 During M-code’s insanely slow progress, other GNSS systems have come along, offering their own encrypted signals of a similar ilk. Looking at Figure 2, M-code no longer appears as special as it once was. Its BOC(10,5) signal sits inside the main lobes of Europe’s Galileo PRS signal, which uses a BOC(15,2.5) scheme, and China’s Beidou B1A signal using BOC(14,2). If you were China, you might consider jamming the central 24 MHz of the L1 band, taking out M-code, whilst still having an operational military service for yourself. Or if you were Russia, you might jam 34 MHz of bandwidth, taking out the US, Chinese, and European systems, whilst still having your GLONASS L1SC military service to use. The situation is more complex than that, of course: each service has the potential to increase signal power in times of conflict, and there is more than one frequency that can be used. But it does demonstrate the essence of the problem: The modern battlespace has moved on, and M-code hasn’t. Figure 3. C/A code ACF. With complex signals come complex receivers, and there several headaches when it comes to M-code receiver design. 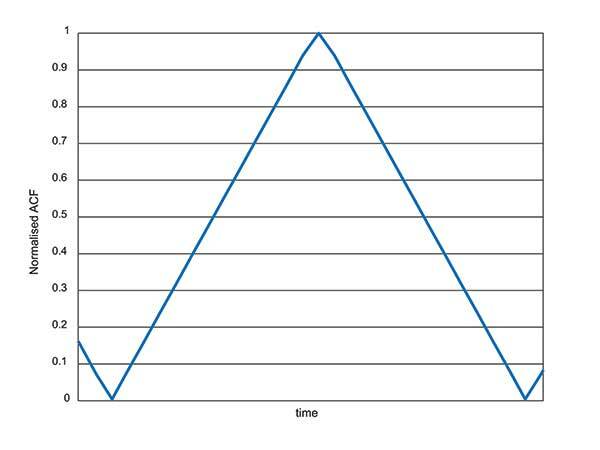 The first is the nature of the BOC signal itself, which has a complex correlation function. 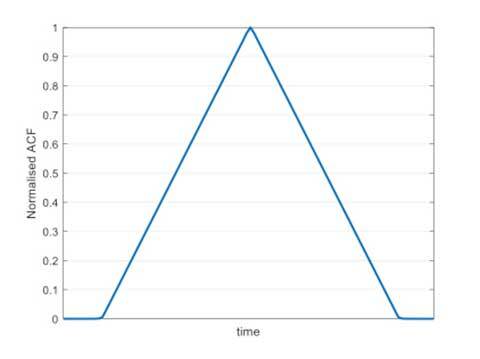 Consider Figure 3, which shows the autocorrelation function (ACF) of the traditional civilian C/A code signal. 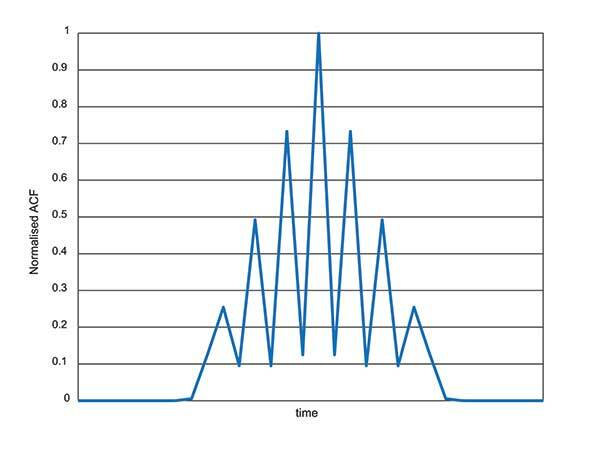 The single peak of the function makes acquisition and tracking a simple process; traditionally early, prompt and late (E,P,L) correlator arms can be used in the tracking process. The newer BOC-type signals have a more complex ACF. 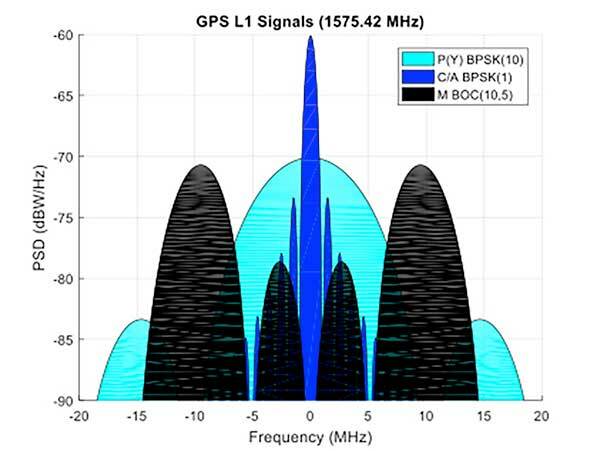 Figure 4 shows the ACF of the new L1Cd civilian GPS signal, which uses a form of BOS(1,1) modulation. In addition to the main lobe, there are now two side lobes. Receivers must be careful not to lock on to one of the side lobes instead of the main lobe: the receiver architecture starts to become a little more complex. Now consider the ACF of the M-code signal, shown in Figure 5. Like other high-order BOC-type signals, M-code exhibits multiple lobes in the ACF, making robust acquisition and tracking a far more troublesome process. Furthermore, the high bandwidths require high sample rates, which lead to higher power consumption in the hardware. Another major headache associated with M-code receivers is, of course, the encryption process. Not because encryption is difficult, but again because of the power consumption implications. Consider that each GPS receiver needs to run an encryption engine instance, for each satellite it might wish to receive. Running a high-grade encryption algorithm at a high chipping rate, for a dozen satellites, is a power-consuming process. 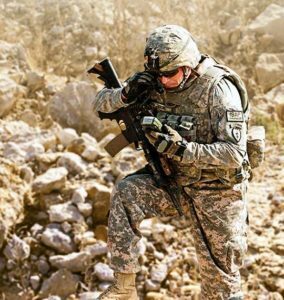 For dismounted soldiers with limited battery capacity, this is a big deal. Some people argue that the high-grade encryption process for M-code is too complex. Consider why we want to encrypt a GNSS signal in the first place: firstly to prevent someone from spoofing our signal, and secondly to prevent unauthorised users from using the service. Given that the encryption keys are rolled regularly, how much does it matter if an adversary manages to compromise the encryption? This isn’t a communications security problem: we are not talking about loss of classified information, so there’s an argument that a simpler, less power-hungry form of encryption might have been used instead. Although M-code offers a certain level of jamming resistance, it is still vulnerable to attacks. As a signal it might have a bit more power, and a bit more bandwidth, than some other signals. But it is, after all, still a GNSS signal, and it can be jammed by an adversary. Where an operational threat analysis indicates that an increased level of jamming resistance is required, then M-code receivers need to be integrated with anti-jam antennas. Anti-jam antennas, usually referred to in the GNSS community as controlled reception pattern antennas (CRPAs), have been the anti-jam tool of choice for several decades now. I overviewed these in an April 2017 newsletter column. CRPA manufacturers have had to ensure that their products are “M-code ready,” such that they can be seamlessly attached to M-code receivers as and when they appear. This hasn’t been a recent process: as far back as 2002, the GAS-1 antenna (Raytheon) underwent a series of qualification tests to ensure compliance with M-code. Around 2005, the ADAP antenna (also Raytheon) was launched with a host of M-code features — again an illustration of just how slow the M-code program has moved, given that other technology has been “M-code ready” for 10 or 15 years already. What’s involved in making a CRPA M-code compatible? Firstly the increased bandwidth: the antenna electronics must digitize the wider bandwidths. Along with the wider bandwidth comes new filtering shapes to ensure optimum performance. Space-time adaptive processing (STAP) and space-frequency adaptive processing (SFAP) techniques potentially require more taps to ensure high null depths can be maintained across the full bandwidth. The increased power of the M-code signal, particularly if features like spot beam are used, presents another complication to CRPAs: they must not treat the high-power satellite signals as jammers, and try to remove them. Testing CRPAs presents a challenge to manufacturers: how do you prove that your antenna doesn’t corrupt the M-code signal, when there’s no M-code signal to test it with? To work around this issue, pseudo M-code signals have been used for testing, where representative BOC(10,5) signals without the real encryption are passed through the CRPA and examined for distortion. Due to the security considerations surrounding M-code, only three US organizations are authorized to produce modules: Collins Aerospace, Raytheon and L3. Here are the answers from Collins Aerospace and L3, the answers from Raytheon will appear in later issue. What are the technical challenges associated with developing an M-code receiver? Collins Aerospace. The Collins Aerospace Modernized GPS User Equipment (MGUE) Increment 1 development like the SAASM PPS receiver developments faced very challenging technical requirements to support our war fighter needs in an ever-evolving threat environment. Like other complex developments the challenges are initially technical and then transition to integration/test and certification. On the technical front optimizing receiver performance balanced against power consumption are always at the forefront. In addition, it is important to maximize backwards compatibility so as to minimize downstream integration costs while adding an entirely new signal that runs in parallel to the existing system. Collins Aerospace is pleased with the technical development and are actively supporting the integration with both receivers and technical support. To date, we have delivered more than 770 MGUE receivers to the Air Force to support Air Force, lead platform and DoD-wide Integration and test. Soon the total will grow to nearly 1,100 receivers to support expanded integration and test following the completion of Collins Aerospace security certification. L3. M-code GPS User Equipment (MGUE) technologies exist today.L3’s Ground Based GPS Receiver Application Module – Modernized (GB-GRAM-M) is a fully-functioning unit that is currently baselined and undergoing an independent Technical Requirements Verification (TRV) by the GPS Directorate.During TRV, each requirement from the Technical Requirements Document (TRD) is independently evaluated for compliance. Upon completion of the TRV, the design is baselined with complete documentation enabling platforms and prime equipment to integrate from a known baseline with low risk. Following integration, operational testing can start immediately to support fielding when M-Code Early Use (MCEU) becomes operational. The TRV of L3’s GB-GRAM-M is planned to be completed by the second quarter of 2019. L3 resolved numerous technical challenges in developing M-code GPS technologies. The first and ever-present challenge is changing and evolving requirements. Most of these requirement changes are in response to evolving threats that have driven changes into the GPS receiver and/or to higher-level systems. Asan example, the U.S. Army’s Assured PNT (A-PNT) is implementing M- code GPS along with external sensors to establish and maintain an assured solution even in GPS-challenged environments. Other challenging requirements include meeting the security requirements, implementing and testing anti-spoofing algorithms, and ensuring backward compatibility with legacy receivers. What are the intended platforms for your MGUE? Collins Aerospace. The Collins Aerospace MGUE receivers are intended to support all warfighter domains: ground, airborne, maritime and munitions to support compliance with Public Law 111-383 SEC. 913 issued in Fiscal Year 2011. Per this directive, M-code is intended for all DoD applications with the exception of passenger vehicles or commercial vehicles with GPS installed. Now that the satellite and control segments of the capability are coming on line, we are working diligently to ensure that user equipment is available for all domains. L3. L3 has products to meet current market demand. Under the MGUE program, L3 developed a GB-GRAM-M, which is a standard Modular Open Systems Architecture (MOSA) design. The GB-GRAM-M is designed to fulfill retrofit replacements of SAASM receivers, as well as being a primary component of A-PNT systems. L3’s M2GRAM ASIC is the core of our receiver, a GPS module that incorporates signal processing, cryptography, and positioning, velocity, and timing (PVT) processing. The M2GRAM ASIC is capable of being implemented in other form factors for applications beyond ground-based applications. As an example, the M2GRAM is implemented in a GPS receiver specifically designed for Precision Guided Munitions (PGM) applications and was used in a gun launched, guide-to-target demonstration operating as a PGM receiver. L3 is also augmenting the GPS receiver through the integration of several other technologies, including controlled reception pattern antennas with digital antenna electronics, inertial systems and external sensors, and GPS-denied capabilities. M-code technologies are being implemented in Mounted A-PNT Systems (MAPS), Dismounted A-PNT Systems (DAPS), and handheld systems to bring capabilities to the warfighter. What is the expected timeline for your MGUE development, acceptance testing, and delivery? Collins Aerospace. The Collins Aerospace receivers are supporting ongoing DoD integration and test and our MGUE Increment 1 program is aligned with the Air Force GPS Enterprise roadmap. Ultimately, the Department of Defense (DoD) M-code programs will set the production delivery schedules. We anticipate that the M-code production ramp-up and continued SAASM PPS receiver production will have a production overlap. Our Collins Aerospace in-house PPS GPS receiver manufacturing capability is ready to support the DoD demand for both M-code and SAASM. Collins Aerospace is fully committed to manufacturing Increment 1 M-code receivers to meet the warfighter’s needs across Airborne, Weapons and Ground, we know the transition from SAASM to M-code will take years. Therefore, Collins Aerospace will continue to manufacture SAASM receivers for years to come as the International MOD Policy for M-code use is still being formulated. L3. L3’s GB-GRAM-M is now available. L3 received security certification and approval in 2016 and TRV is planned for completion in the second quarter of 2019. With TRV, L3 is receiving a new security certification and approval of the latest receiver update. Government agencies, prime contractors and laboratories can order GB-GRAM-M now with delivery in the fourth quarter of 2019. What does testing and verification process involve? Collins Aerospace. As with any Precise Positioning Service (PPS) GPS development, the testing involves functional verification of the receiver in a wide variety challenging of environmental, thermal, electromagnetic interference/ high-intensity radiated field (EMI/HIRF) environments. Collins Aerospace is leveraging proven test and verification approaches founded upon our long history of successful product introductions and field performance. As this is a PPS receiver it is also essential the receiver design comply with the government’s required Security Approval process. L3. The testing and verification of L3’s GB-GRAM-M included internal testing and independent testing through the GPS Directorate’s TRV process. Further risk reduction testing within the MGUE program is planned as Phase IV testing where the GB-GRAM-M is integrated into a lead platform for the U.S. Army and a lead platform for the U. S. Marine Corps. An operational assessment is performed on both lead platforms to assure common problems associated with integration and operational testing are addressed prior to implementing M-Code GPS Receivers across all of the platforms. Will the MGUE be compatible with CRPA anti-jam antennas; are there any special considerations for this? Collins Aerospace. The Collins Aerospace product family includes our Digital Integrated Anti Jam Receiver (DIGAR) product family that leverages CRPA anti-jam antennas for enhanced anti-jam (AJ) performance. Our DIGAR AJ technology enhances the performance with fixed reception pattern antenna (FRPA), CRPA and is compatible with all PPS waveforms. Regarding the interfaces between the receiver and the anti-jam antenna electronics, a GPS receiver with a standard RF interface is compatible with a CRPA in nulling mode and FRPA antennas. Advanced capabilities such as beamforming/beamsteering require tight coordination and additional interface with the GPS receiver. L3. The GB-GRAM-M is designed to operate with a fixed reception pattern antenna (FRPA). A CRPA antenna using digital antenna electronics to generate signals matching the characteristics of a FRPA is fully compatible with the GB-GRAM-M. With a higher level of integration of a GPS receiver and a CRPA, the system capabilities are greatly enhanced. L3 has performed this integration and can perform advanced capabilities such as angle of arrival and beamforming using M2GRAM, digital antenna electronics, and CRPA technologies. These capabilities can be found in L3’s Mounted Assured PNT System (MAPS) and Anti-Jam Antenna System (AJAS) products. The U.S. Air Force GPS Directorate provided answers to the following questions regarding MGUE. Which platforms will be equipped with M-code-capable MGUE, and how many of each? and the Navy Arleigh-Burke class destroyer (DDG). Following the lead platform efforts, procurement of M-code-capable GPS receivers will be decided by the Services and executed by individual platforms and programs. What are the timelines for rolling out M-code on these platforms? GPS Directorate. Early integration and test activities have already begun for each MGUE lead platform. 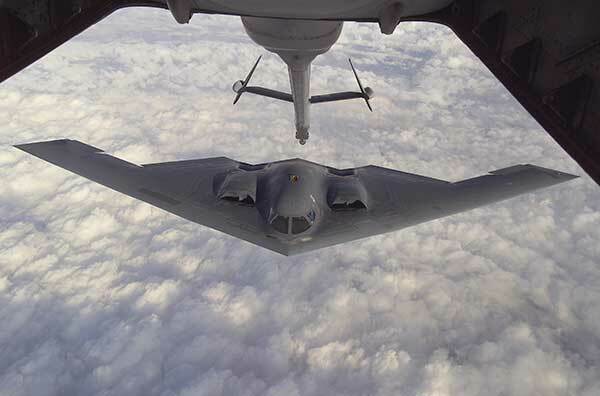 Operational testing is expected to begin in 2020 and complete in 2021, which is a key activity to enable the fielding of M-code-capable systems. What advantages will M-code bring, over existing military GPS receivers? GPS Directorate. Modernized GPS receiver cards under development with the Air Force MGUE Increment 1 program will enable the use of M-code and provide U.S. forces with enhanced position, navigation, and timing capabilities, in addition to improving resistance to threats, such as jamming efforts by adversaries. How will keys and key distribution be managed? GPS Directorate. None of this is publically releasable. Will M-code be made available to other friendly nations? If so, how is this managed? GPS Directorate. The current policy allows for the sale of M-code equipment to all 57 authorized GPS PPS nations. The M-code technology will be made available to these nations through the Foreign Military Sales process. The Department of Defense supplied answers to the following questions for users and warfighters. What are the benefits you perceive will come from new M-code GPS equipment? DoD. 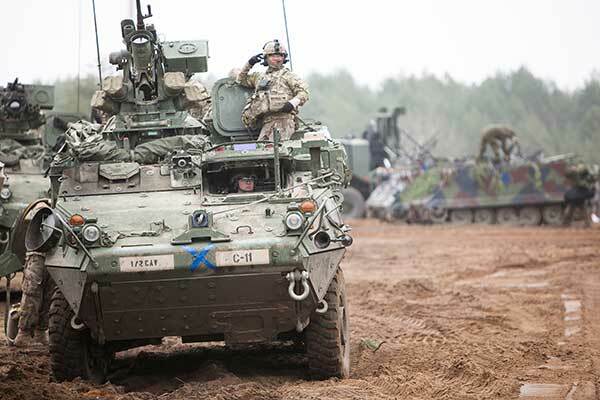 Provides U.S. forces with enhanced position, navigation, and timing capabilities, in addition to improving resistance to threats, such as jamming efforts by adversaries. Will it change how you perform military operations, or enable any new ones? DoD. Modernized GPS receivers provide the next-generation GPS capabilities to the warfighter. Operational testing will enable the services to determine operational utility of MGUE. It will ensure our soldiers, sailors, airmen, and marines have the ability to get in, accomplish their mission, and get home accurately. How will M-code-based GPS receivers be brought into operational service? Will there be a mass upgrade of assets, or a phased introduction? DoD. Procurement of M-code-capable GPS receivers will be decided by the Services and executed by individual platforms and programs.